Spring Bay Inn Our records show that this inn is closed. Buck Bay Farm Our records show that this inn is closed. Olga bed and breakfast travel guide for romantic, historic and adventure b&b's. 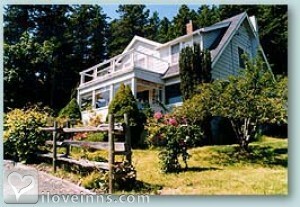 Browse through the iLoveInns.com database of Olga, Washington bed and breakfasts and country inns to find detailed listings that include room rates, special deals and area activities. You can click on the 'check rates and availability' button to contact the innkeeper. Olga, Washington, on Orcas Island, is surrounded by beautiful scenery. Horseback via Orcas Island Trail Rides is an amazing way to see the area. Among the trails for horseback or on foot are those in Mount Constitution and Mountain Lake. The Hot Ice Studio is a shop that makes crystal glazed porcelain items. The waters off Olga are ideal for fishing. Visitors try the Orcas Island Fishing Charters. Those who want to go kayaking can rent at Orcas Island Kayaks, at Leiber Haven Resort and Marina. A trip to Orchard Falls Farm can be guided by innkeepers at Olga bed and breakfast inns. Other attractions in Olga are Buck Bay, Moran State Park, Orcas Island Art Works, and Obstruction Pass Trail By Sand Dollar Inn.